Do You Know What State has the highest rate of Obesity in the U.S.? Obesity is an epidemic in this country. The numbers of people who are obese is staggering. This does not even include the people who are simply overweight. If we take that into account more than 66% of Americans are living at an unhealthy weight. The problems with our lifestyles are numerous. We eat too many carbohydrates, we don’t eat enough vegetables, we don’t get enough exercise, the activities that we do participate in are too sedentary and the list goes on and on. So do you know what the most obese cities are? How about the slimmest? What about state by state? I have that information for you. Well certainly Texas has a lot of work to do. They’ve made the list 4 times. I guess it’s a bit of a surprise to see Miami in the number 1 spot, but statistics don’t lie. Not surprisingly Colorado has two of the fittest cities in the U.S. and they happen to have the lowest overall obesity rates in the country. See below. The South has some major problems with obesity. This has been known for years. 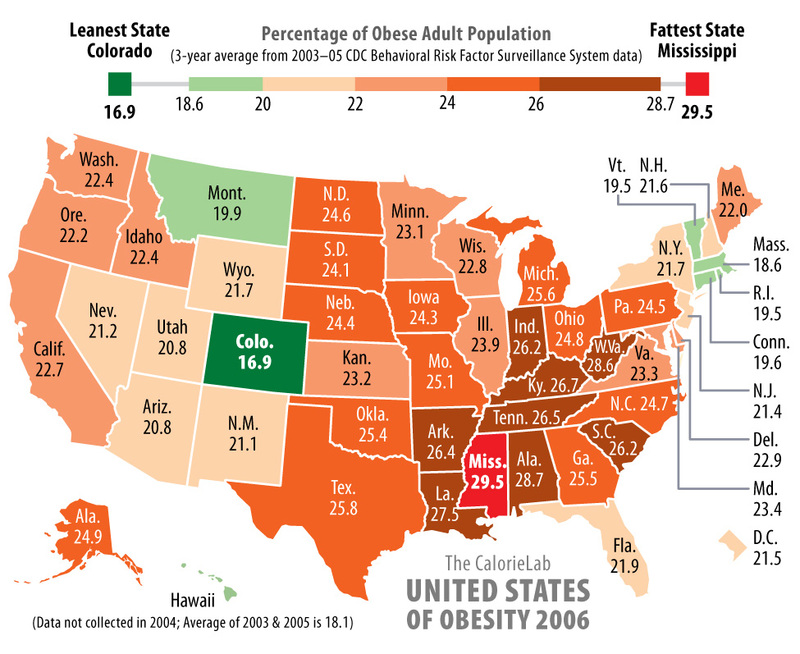 The real danger is that almost a third of Mississippi is obese. People who are obese are a significant risk for many diseases. The CDC says that obesity is directly linked to at least 1/3 of all cancers. The answer is not a mystery. We need to cut the junk out of our diets and get moving. Regulations need to be made that advertisers cannot pitch sugary junk food to kids and parents as some kind of health food simply because they add some B vitamins to the formula. Seeing ‘low in cholesterol’ on the box does not make it healthy. Low in fat also does not mean it’s good for you. People need to be taught, starting in grade school, how to evaluate food. If that happens then people will be armed with the tools to buy the proper foods and not feel overwhelmed at the grocery store. I hear that constantly from my patients. They just don’t know how to buy food. They think they’re doing well because they read some claim on a label that tells them it’s good for them when in reality it is not. If we can teach people how to eat, we can reduce obesity and health care costs in one shot. These kinds of programs need federal funding so schools can put them in place. They need to be on the scale of D.A.R.E and the anti-smoking campaigns. If they’re not, it won’t work. They only way to fix this problem is to give people the power to make the correct decisions.